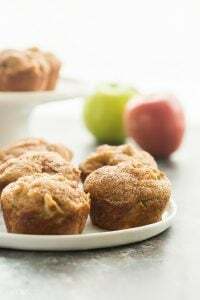 These Cinnamon Apple Muffins are so moist and loaded with apple chunks, unsweetened applesauce and cinnamon. 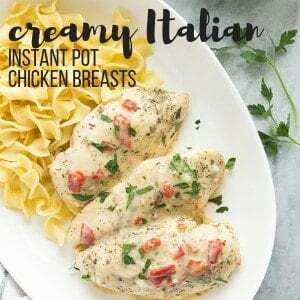 They are big on flavor and made with healthier ingredients. Muffins, breads, baked goods — they are always a hit around here. 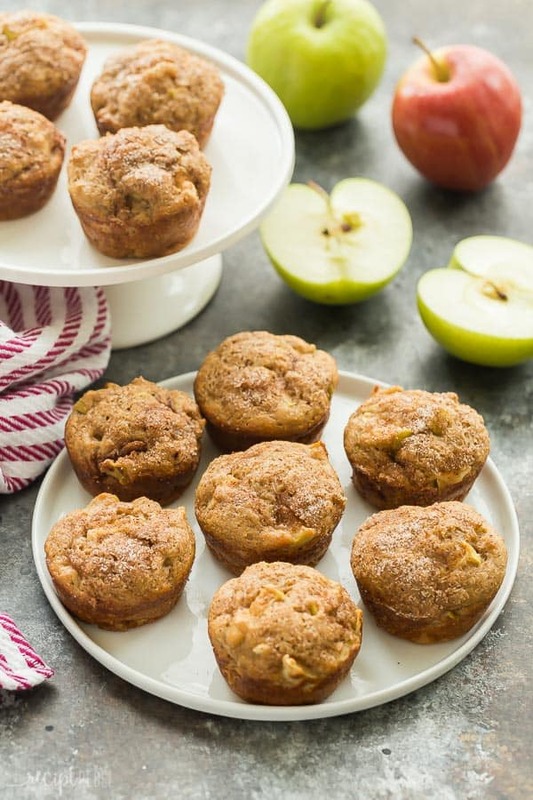 These Apple Muffins are no exception! I know you are probably over apples already and I should be on to peppermint and Christmas baking, but I’m not letting go. Fall is just getting started, and I’m going to hang onto this beautiful season as tight as I can before we’re hit with the first big snow! With our oldest in grade 1 this year and my husband still busy and gone 14 hours per day, we’re packing a lot of lunches (and those of us who aren’t packing lunches still need snacks! Just ask my 3 year old 😉 ). 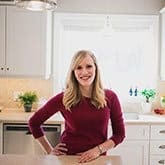 I love to have a big stash of muffins and quick breads in the freezer for quick breakfasts (you know, just in case my kids ever sleep past 6:30 am…..) and something hearty to stick in lunch boxes. There’s not guarantee that the veggies in my 6 year old’s lunch box will get eaten, but breads and baking? Pretty much a given! For this reason, I like to load my baking up with the healthiest ingredients I can without sacrificing flavor. Choose the right apples. Generally, firmer apples work better for baking because they don’t turn to mush in the oven. You also want a sweet-tart flavor that will really pack a punch in any baked goods. See this article for choosing good baking apples. Don’t overmix. Mixing the muffin batter too much can give you tough, dry muffins, so go easy and mix just until all the dry goods are incorporated. Don’t overbake. This is pretty much my favorite baking tidbit for any baked good, because I love my baking to be moist or chewy or luscious but definitely not dry and overbaked. You want to bake until the centers are completely set, but not much past that point or you will have dry lumps of muffins. 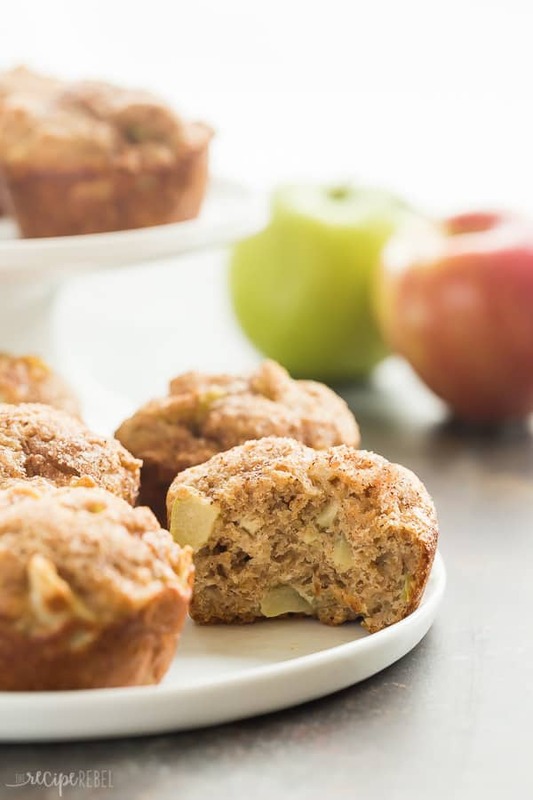 What makes these Apple Muffins healthy? 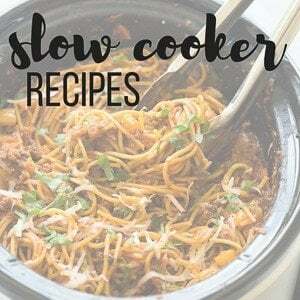 For this recipe, I used whole wheat flour, unsweetened applesauce and Greek yogurt instead of butter, and rely mostly on the natural sweetness of the apples (although there is still some sugar!). This makes these muffins a healthier but still delicious lunch or breakfast option! These Apple Muffins freeze perfectly in an air tight container or freezer bag. You can store them up to 3 months. To thaw, you can leave out on a plate for an hour or two at room temperature, or microwave on low heat for roughly 1-2 minutes. Can I make these apple muffins into apple bread? In a large bowl, whisk together yogurt, applesauce, eggs, vanilla and brown sugar until smooth. Add baking powder, baking soda, cinnamon and salt and whisk until combined. Fold in flour and apples with a spatula, just until moistened and no flour remains. Lightly grease a non-stick muffin pan or fill with paper liners, and fill muffin cups 3/4 full. To make the cinnamon sugar, stir together cinnamon and sugar. Sprinkle over muffins before baking. Bake for 18-20 minutes, until a toothpick inserted in the center comes out clean or with moist crumbs. Let cool for 5-10 minutes in the pan before removing to a wire rack to cool completely. I made these muffins this morning and they are delicious. One of the easiest and best apple muffin recipe I have made. I added walnuts and they are so moist and tasty. 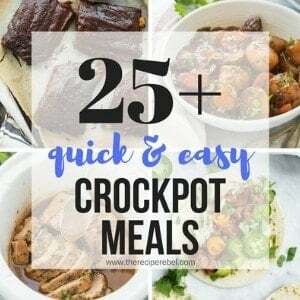 I love your recipes! Thanks! I’m so glad you enjoyed them! Thanks Maureen! My daughter is celiac and all “healthy “ baked goods calls for whole wheat flour. Any idea for substitute.